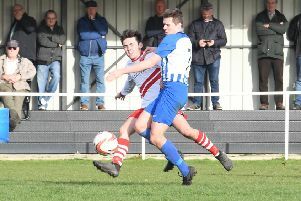 Skegness Town were beaten 3-0 at NCEL Division One rivals Emley, a reverse of last month’s score at the Vertigo Stadium. The first half was one for the lacklustre Lilywhites to forget as they lost in-form striker James Wroot to injury and fell behind via a 44th-minute penalty. And Emley doubled their advantage against Nathan Collins and Martyn Bunce’s side moments into the second 45, adding a third at the death.